The most troubling aspects of mesothelioma is that a patient’s symptoms do not appear until decades after one has been exposure to asbestos fibers and the cancer is in an advanced stage. 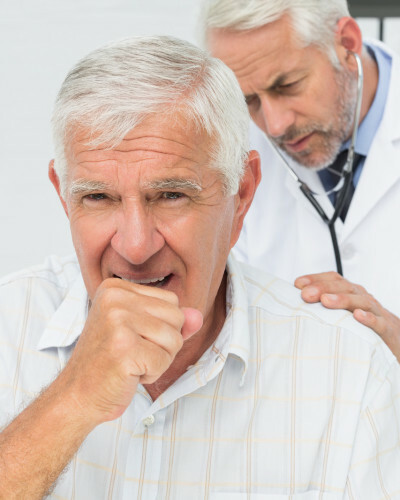 Depending on the advancement of the disease, mesothelioma is usually discovered when a patient visits a doctor or hospital complaining of symptoms resemble pneumonia – shortness of breath, a persistent cough, pain in the chest, back and abdominal area. This accumulation of fluid in the affected area is called an effusion. The next most common form of the disease is peritoneal mesothelioma, which affects the lining of the abdomen and accounts for roughly 20% of mesothelioma diagnoses. Here, tumors develop and a buildup of fluid occurs placing pressure on the abdominal organs. This pressure produces symptoms such as pain and swelling in the abdomen, chest pain, shortness of breath, and difficulty breathing. The rarest form of mesothelioma is pericardial and accounts for less than 5% of all mesothelioma cases. The disease is extremely rare and difficult to diagnose. This type of mesothelioma occurs when asbestos fibers travel from the lungs to the mesothelial tissue that surrounds the heart. As a result, cancerous tumors expand, thus restricting heart function and sometimes cause cardiac failure. Symptoms of pericardial mesothelioma include chest pain, heart palpitations, fatigue, and night sweats. As with the other types of mesothelioma, the symptoms are caused by the thickening of tissue and build-up of fluids in the region. Testicular mesothelioma (also called mesothelioma of the tunica vaginalis) is a form of mesothelioma, with fewer than 100 cases of the disease recorded in the last 60 years. Due to the rareness of the disease, very little is known about its symptoms. The only clear symptoms of testicular mesothelioma are the appearance of lumps under the skin of the testicle and hydrocele, a buildup of fluid in the scrotum. Pleural effusion in patients with pleural mesothelioma occurs when there is too much fluid buildup between the two membranes surrounding the lungs. Symptoms include chest pain and difficulty breathing. Relief can be achieved by performing a surgical procedure known as thoracentesis where the fluid is removed from the lungs. Peritoneal effusion in patients with peritoneal mesothelioma occurs when excess fluid occurs in the peritoneum membrane protecting the abdomen. Symptoms include a sensations of swelling, tightness and general discomfort. Paracentesis is the procedure that doctors perform to remove the build-up of fluid in the peritoneum and alleviate its symptoms. Pericardial effusion in patients with pericardial mesothelioma occurs in the pericardium, or sac surrounding the heart. Symptoms include an increased pressure on the heart, resulting in chest pains and the sensation of a chest tightening. Pericardiocentesis is the procedure that doctors perform to remove the excess fluid from the pericardium.